Fourstar’s corporate Sustainability Report is just one component of a much broader company-wide philosophy that we practice. Some of Fourstar’s programs include employee participation in community outreach, 401(k) sustainable and impact investing options, decrease of our carbon footprint by installing a 110kW solar panel array, LED lighting throughout our facility, upgrading to higher-efficiency equipment, and providing electric car charging stations. Fourstar was awarded a first-of-its kind sustainability grant from the Commonwealth of Massachusetts, Executive Office of Labor and Workforce Development to help fund the MVP Sustainable Supply Chain Program, which focuses on sustainability, supply chain transparency, and reporting to the carbon disclosure project and other customer-requested disclosures. As a recent recipient of the Green Manufacturing Award by the Worcester Business Journal, Fourstar was recognized for its commitment to sustainability initiatives. Although we can’t control what others do—in personal, business, or political circles—to protect the future of the planet for our children, we are making a diligent effort to further these vital initiatives and do everything within our reach to positively impact our stakeholders, the community and the planet. We do have control over the measures we take as a company to mitigate the consequences that over-consumption of natural resources has on our planet. We are proud to be a responsible steward to our community, locally and globally. We take our responsibility as a trusted supply chain partner very seriously and hope to be role models for other businesses that want to adopt similar sustainability-focused endeavors. People are generally aware of large, multi-national corporations pursuing sustainability initiatives, but we are unique in our manufacturing sector. Aside from the benefit to the environment, we recognize that integrating sustainability practices across our reach is also good business because it has proven to increase performance, efficiency in costs, processes and resources, and ultimately result in better customer outcomes. For more information on Fourstar Connections and our sustainability initiatives, visit this page on our website. 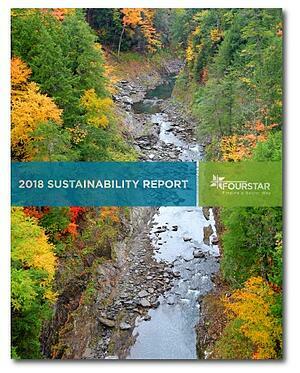 Click here to download Fourstar’s first annual Sustainability Report.